Visual TFT supports 17 TFT controllers and multiple display resolutions. So, we even have the hardware prepared for your next graphic project. 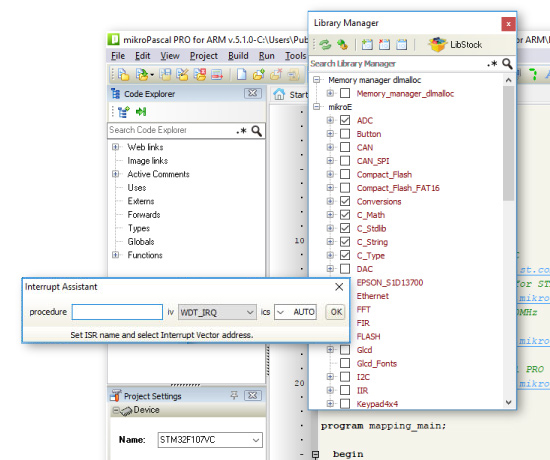 Libstock Manager is the newest addition to our PIC compilers with the release version 6.1.0. Don’t waste your time browsing for examples. Let them come to you. New Project Explorer window leads you to your projects. It displays all of compiler’s many included examples by default. But simply point the path to any other folder and fast recursion-search algorithm will extract all of projects inside and will display a tree view of your project files up to any depth. 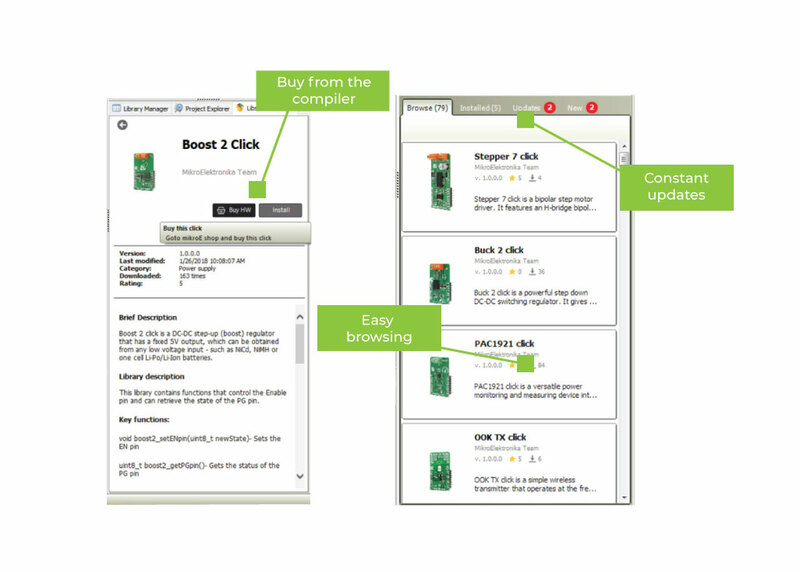 Double click opens the project and sets it as active. 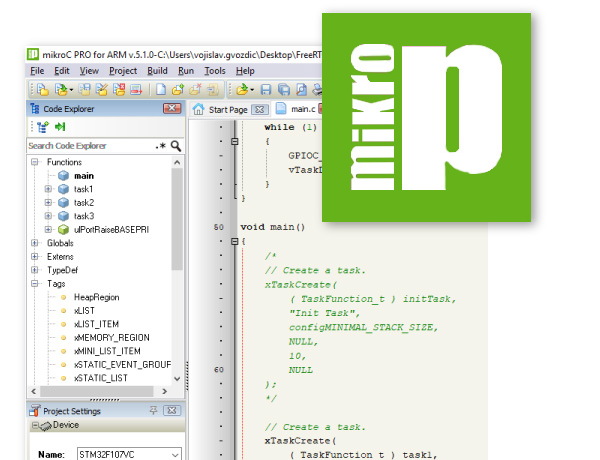 Only mikroPascal offers the unique mechanism to easily use any available library in your project. Special OneClick technology allows you to speed up your development. No need for dozens of #include directives. Focus on your code, and let the syntax write itself correctly. Write function calls with one click of your keyboard. 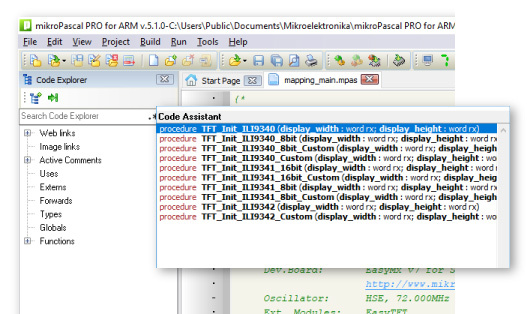 Code assistant in mikroPascal PRO for ARM® also suggests correct names of constants and variables, so you have it all covered. You don’t ever have to get another Syntax error message. 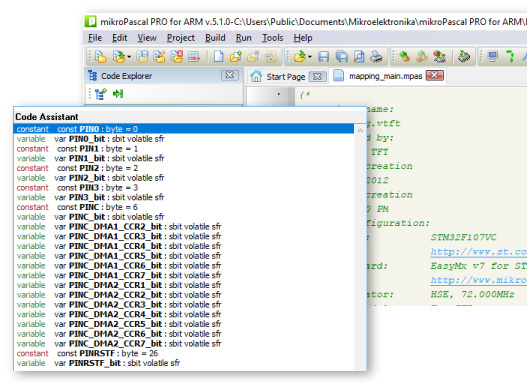 We have developed Active Comments - a unique feature of mikroPascal PRO for ARM®. Any comment can become your multimedia event hook. What’s the point of a compiler if you have to do all the hard work yourself. 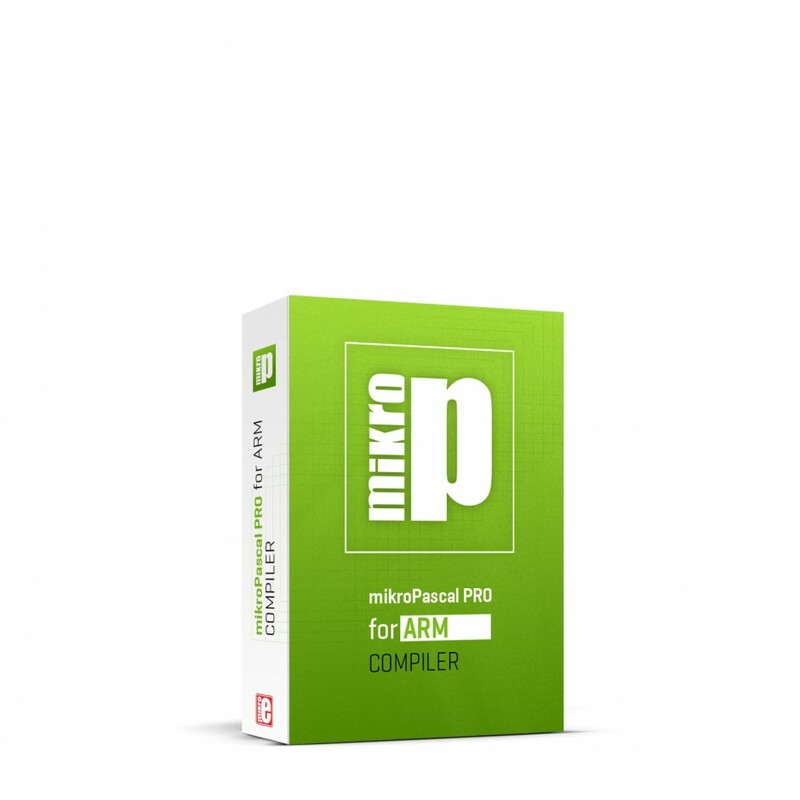 mikroPascal PRO for ARM® offers you several most useful integrated tools that will help you get the job done with minimum effort. 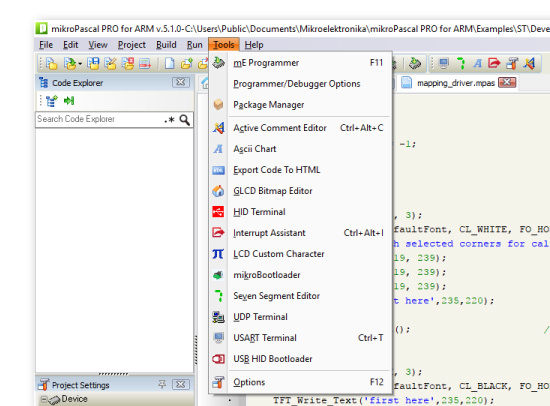 mikroPascal PRO for ARM® has native support for hardware step-by-step In-Circuit Debugger when used with fast USB 2.0 mikroProg™ programmer (in both on-board and standalone version), or Stellaris® debuggers. Debugger is a separate DLL module which supports Step-over [F8], Step-into[F7], Step-out[Ctrl+F8], Run[F6], Run To Cursor[F4] debugging operations. 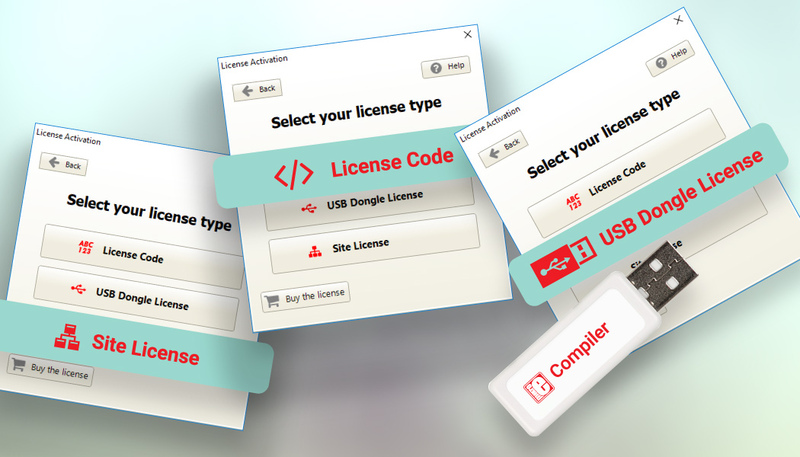 Browse and Install LIbstock packages directly from compiler. Added: Timeout functionality with callback for all MMC libraries on SPI communication, MMC response and MMC initialize. Fixed: SPI write (STM M7) sometimes doesn't send complete 16bit of data. 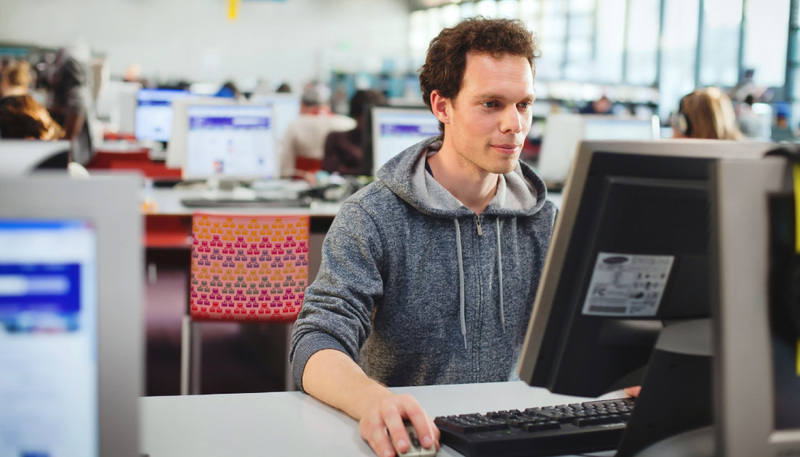 Library Manager now can open library source on right click, if source is present. 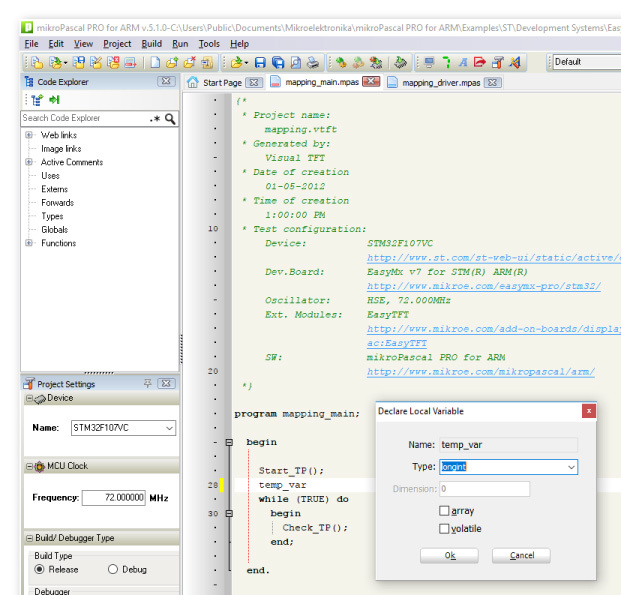 FreeRTOS debug supported with tasks and queues view. 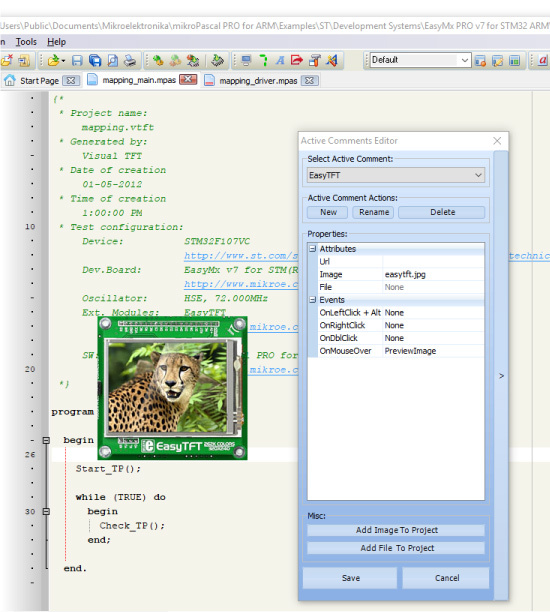 Added new view to Project Manager to support displaying complex project sub tree. Project file now saves and loads relative paths. Updated the Bootloader application with automatic hardware recognition feature. Watch window elements with Inf or Nan values changed unexpectedly. Watch windows throws unexpected error in certain case. 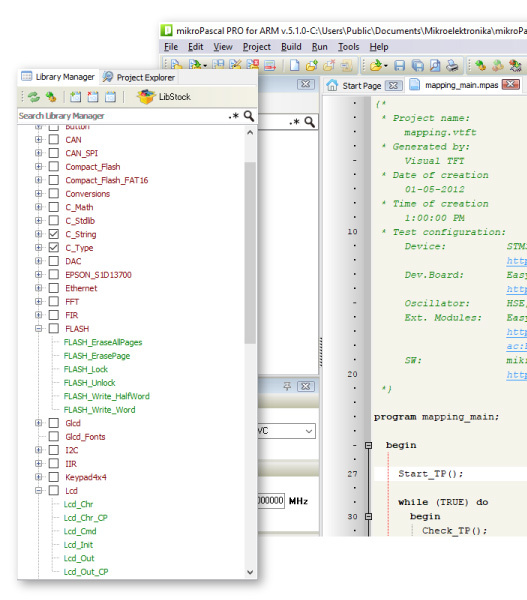 IDE crashed on fast switch between editor tabs. Edit project sometimes crashes when trying to change MCU. Fixed: Debug start when welcome screen in focus sometimes result in IDE crash. Added: Support for Kinetis MCU family. 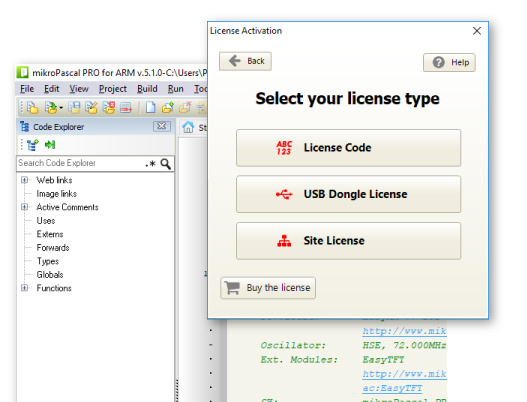 New: Added site license activation. Improved: Compiler throw warning if enum is mixed with integer type that exceed its range. Improved: Optimizer added const folding for cast operation. Improved: Ctrl+space did not work with arrays without dimension in declaration. Improved: Added const folding for cast operation. Fixed: Compiler goto after if caused compilation error. Fixed: Compiler ? : operator error with sbit as 1st operand. Fixed: Compiler initialization with &arr caused error. Fixed: Compiler binary number with 64 bits. Fixed: Emcl writer error for local sbit. Fixed: Compiler funcall pragma and optimizer conflict state. Fixed: Linker local extern used only in assembly caused error. Fixed: Linker jump compression error M0 core. Fixed: Linker literal assignment compression error M0 core. Fixed: Linker false static function redefinition error in some cases. Fixed: Ctrl+space did not work with arrays without dimension in declaration. Fixed: Jump to interrupt in simulator didn't work. Fixed: Watch window elements with Inf or Nan values changed unexpectedly. Fixed: Watch windows throws unexpected error in certain case. Fixed: Out of memory error for extremely big symbols. Fixed: Gpio Defs for STM32F401x mcus. Fixed: Added missing registers for floating point unit in STM32F334 mcus. Fixed: GPIO library for STM32L0 mcus. Fixed: ADC library for STM32F401 mcus. Fixed: Wrong consts and address offsets in Flash library for STM32F42x and STM32F43x. New! Added examples for STM32F746VG mcu in Internal MCU Modules group. New! Added examples for CEC1302. New! 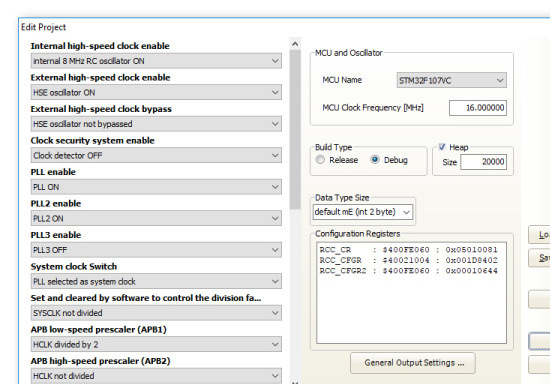 Added NVIC_SetIntPriority function for STM mcus. New! Added EEPROM library for TIVA mcus. 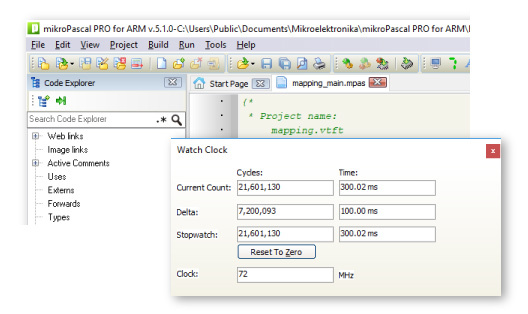 Fixed: PWM library for STM32F40x/41x. Fixed: Issue in autonegotiation process for ST MCU-s with Ethernet module. Fixed: In I2C libraries for STM32F307/407 POS bit is now cleared after read in 2 bytes burst mode. New! 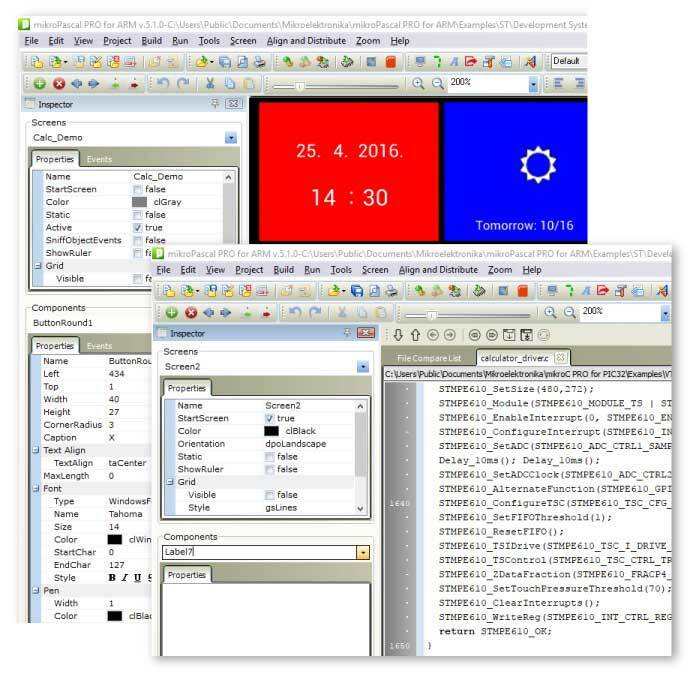 Added examples for EasyMx PRO v7 for TIVA. New! Added examples for mikromedia for TIVA. New! 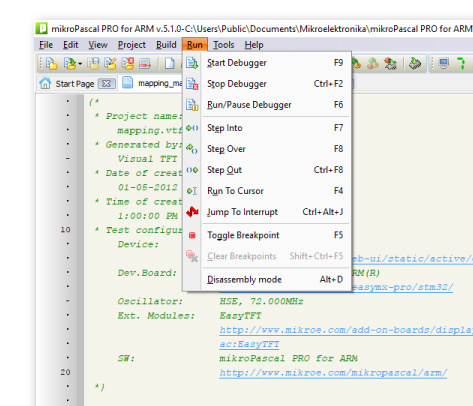 Added example for EEPROM module for TIVA. 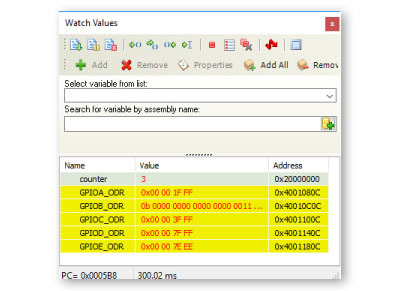 Fixed: Some variations of LDM and STM instructions wasn't supported in assembler. Fixed: Code generator, comparing long extern constants yields "Argument ot of range". 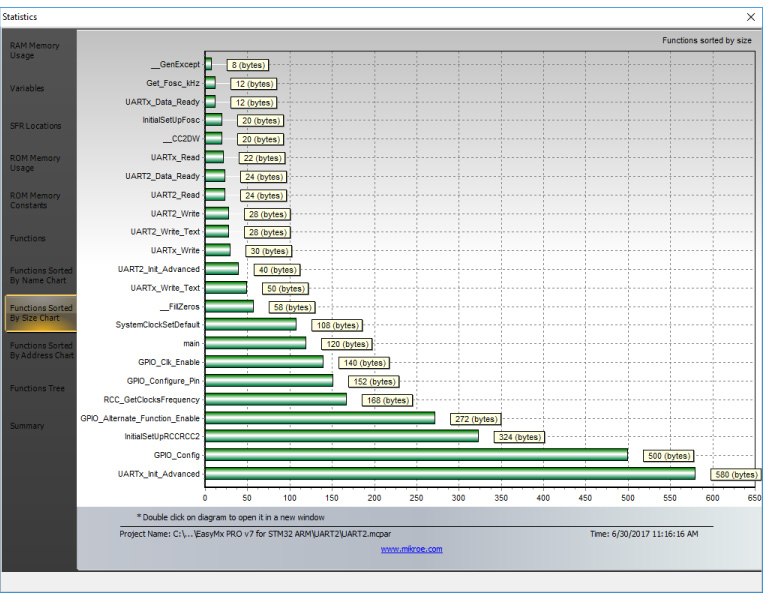 Fixed: Comparing 64bit long variables used incorrect compare condition. New! GPIO consts are now moved to 'Defs' file. New! Added standard headers assert.h, stdbool.h and time.h. New! Added library support for Touch Panel controller TSC2006 (SPI controlled). Fixed: Incorrect return in certain branch in system function LongDoubleToFloat. Fixed: Bit-band problem with STM32F3xx mcus. Fixed: SPI const in SPI library for TI M3 and TI M4 mcus. Fixed: Resolved bug in SPI_Ethernet_readPHY function of SPI_Ethernet library. New! Added examples for mikromedia 5 for Tiva. Fixed: Added longer delay for conversion time in OneWire example. 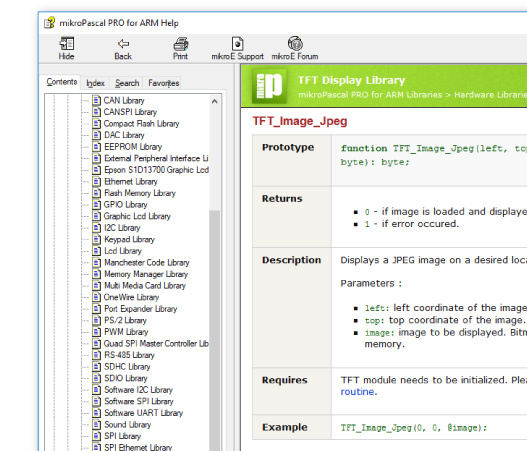 New: ARM Cortex M0 support. Fixed: Code generator, incorrect access to float variables on stack for M4 devices. New! Added library for DAC module in STM32 famillies. Improved STM32 GPIO_Config function, added options for configuring alternative pins. Improved Added new functions in PortExpander library. Improved Added support for ESC key in PS2 library. Improved Added new functions in Conversions library. Fixed: ADC library for STM32 30x. Fixed: Several bugs in STM32 CAN libraries. New! Added example for DAC module. Fixed: Resolved bug with HID Bootloader example and USB 3.0. Fixed: Built-in Delays for STM32F3xxxx MCUs. New! Q15 and Q31 Libraries for Cortex M4 MCUs. Fixed: GPIO Library for STM32F4xx MCUs. Fixed: System Library for STM32F3xx MCUs, HSI calibration. Fixed: Initial oscillator start-up to accomodate frequency change after software reset (bootloader issue). New! Digital Signal Processing (FFT_Convolution, FIR_Demo, IIR_Demo, Vectors, Matrix).